Green House works in Ituri and North Kivu primarily with low-income populations who wish to increase their crop productivity and household incomes through farming. Prior to the ECI engagement, the organization operates a seed bank, nursery, demonstration field, and produces agricultural products for purchase by the local community. With the ECI partnership, Green House is improving the quality and production of cocoa beans in North Kivu and the southern region of Ituri and expanding market access through a promising partnership with Theo Chocolate. With ECI funding, the director of Green House received training to support farming families and help them build sustainable businesses, in creating basic fermentation centers and improve processes of cocoa bean fermentation. Green House staff then identified area farmers for participation in the initial setup and construction of two small fermentation centers which included farming collectives and provided training in fermentation practices. 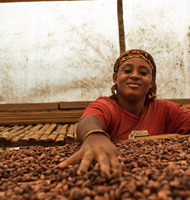 Foreign demand is strong and growing for quality cocoa and the project has promoted a shift in attention from other African countries to eastern Congo as a source of marketable vanilla as well. Production levels in eastern DRC have the potential to significantly expand by training more farmers to grow cocoa. The global market price for cocoa is poised to provide farmers with a strong incentive for cultivating cocoa. Many poor families have land that is arable, but they only grow crops such as cassava, which has a low net benefit. Encouraging farmers to grow cocoa in addition to their food crops through the provision of training and seeds will increase the production in the region and the annual income of the farmer, ultimately helping to lift thousands of Congolese people out of poverty, giving farming families the opportunity to send their kids to school, and improving their access to healthcare.